Are you interested in volunteering at Ocean Lakes ES? We LOVE having volunteers at Ocean Lakes! It's part of what makes learning fun at our school. Please check out the VBCPS Volunteers in Education web page for a request to volunteer and how to log volunteer hours in the Get Connected database. Girls on the Run meetings normally take place on Tuesdays and Thursdays from 3:00-4:30pm. How to join Girls on the Run: See program details by visiting the official Girls on the Run website. Meetings take place on Wednesdays from 2:45-5:00pm. Students in the 3D printing club will work in small teams to invent a product that can be manufactured using 3D printing technology and present their proposal before a "Shark Tank-style" panel. Students will research possible items to develop, document their progress, use Google SketchUp to convert designs to digital renderings, and fabricate their designs using a MakerBot Replicator 3D printer. How to join the STEM MakerBot 3D Printer Club: Membership is limited to 8 fourth and fifth graders based on academics, attendance, essay, and teacher recommendations. Meetings are held weekly on Monday afternoons from 2:45-4:30pm from mid-October through early June. Students are expected to attend all regularly scheduled meetings. Please see Mrs. Yon for an application. Online applications are NOT available. Meetings take place on Wednesdays and Thursdays from 2:45-5:00pm, except when there are school holidays or adjusted dismissal. All club meetings are posted on the Ocean Lakes ES Activity Calendar. Where else can you learn to solder, program, fabricate, and drive a robot? Our students research problems, document their progress, create an iBook, solder their own circuit boards, use SketchUp software to design parts, learn the basics of computer programming, and fabricate parts using a MakerBot Replicator 3-D printer. We have some absolutely awesome parent and military volunteers who help make this program possible. Ocean Lakes ES parents who are interested in volunteering with the STEM Robotics Club should contact the school office or one of the club sponsors directly. The Ocean Lakes ES STEM Robotics Club has enjoyed an extremely successful first six years. Our students and parents have risen to the occasion and worked well together to solve ecological and industrial problems using robots in preparation for the VBCPS STEM Robotics Challenge. 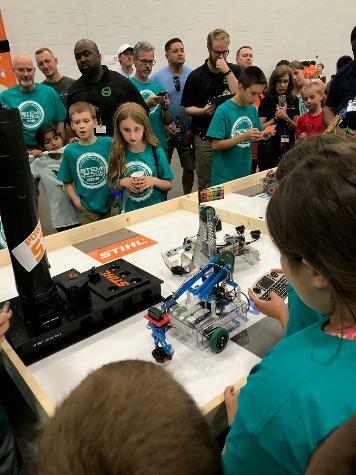 Ocean Lakes ES has consistently placed all of its teams in semi-final competition, and finished in first or second place five out of six years the club has been in existence. Parent and volunteer support has been instrumental in making this success possible! Thank you! How to join the STEM Robotics Club: Applications are available to fourth and fifth grade students beginning in late September. Membership is limited to 12 fourth and fifth graders based on academics, attendance, essay, and teacher recommendations. Meetings are held weekly on Wednesday and Thursday afternoons from 2:45-5:00pm from mid-October through early June. Students are expected to attend all regularly scheduled meetings. Please see Mr. Peake for an application. Online applications are NOT available. Interested in helping Ocean Lakes ES be a better school? Get involved with the SCA! Students may serve as an officer (president, vice president, secretary, treasurer, or historian) or as a homeroom representative. How to join the SCA: Check with the SCA sponsor for an application. Applications are typically available in early September, with candidate speeches and balloting taking place in late September or early October. Your morning announcement team since 2006, the Waverider Morning News Team broadcasts live every school day. This is a fully student-run program. Crew members collect announcement and weather information, update graphic and teleprompter files, serve as announcers, audio technician, video technician, and director. Each class in the school provides guest "pledgers" daily for the Pledge of Allegiance, and OLES students occasionally appear for special announcements and events. We have served as a model for video morning announcement programs in a number of other Virginia Beach schools, including several middle and high schools. How to join the Waverider Morning News Team: Applications are available to rising fifth grade students in April of each school year and the team is selected in mid-May. Membership is limited to 6 fifth graders and one alternate. Membership is based on academics, attendance, teacher recommendations, an essay, and a screen test. Students are expected to arrive early daily for setup and announcements. Meetings for the purpose of practice and special announcement preparation are held weekly on Monday afternoons from 2:45-4:00pm. Ever wonder what it would be like to run a marathon? Join the Waverider Running Club and find out...one mile at a time! Students participate in the Operation Smile Final Mile by meeting weekly to run with their friends. Members are expected to run on their own time, as well, with the cumulative distance adding up to 25.2 miles by the date of the Shamrock Marathon Operation Smile Final Mile. Club members' "final mile" of their marathon will occur at the Virginia Beach Oceanfront during the Shamrock Marathon weekend..
How to join the Waverider Running Club: Permission slips are available to students beginning in December of each school year. Membership is open to any Ocean Lakes ES student, and parents are encouraged to participate. Meetings (runs) are held weekly on Friday mornings from 7:00-7:45am from January through race week. Register online at www.shamrockmarathon.com.